When I look at orange I feel ready to launch into song! The vocal and artistic statement, which Jane Marsh makes, would be hard to match in any generation. Verdi invites me to get to the essence of my core vocal color. Critiques are important in marketing a career, but we need to be careful not to put our self-esteem in the hands of critics. ...with strong overtones of special ness. Ms. Marsh performed...among others...the lush Italian Songbook by Joseph Marx...superior vocalism and execution from Ms. Marsh, for any age and era. Jane Marsh in the recording studio. NOTE: Selections may take upwards of 20 seconds before playing on slow dial-up connections. For this reason, these AUDIO (sound clips) are more or less two to three minutes, exhibiting all or the main potions of each individual selection. 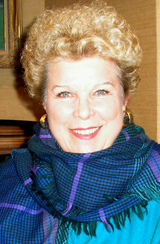 Additional audio selections can be found on YouTube at https://www.youtube.com/user/JaneMarshSoprano. Please view Jane's Blog for personal reflections, lectures, master classes, and upcoming performance information. To order, please order online at Oxford University Press (abroad UK) and Amazon.com (USA).